How blessed we are this year to have had the opportunity to have seen The Passion of the Christ and use it as a reference point for our consideration and meditation for this Lent, this Holy Week and this Sacred Triduum. Even if you haven't seen the movie, don't feel left out - there's always DVD or VHS. In this film one of the most dramatic scenes for me was during the actual Crucifixion, when the film would cut back and forth between our Lord's death and the Last Supper. When Christ is stripped of His garments, the film flashes back to the Last Supper when the unleavened bread is unwrapped and presented to the Apostles. When the crucifix is raised, it recalls Jesus elevating the host. The connection between the Mass and Calvary are unmistakable. The movie suggests that the Mass is a representation of Calvary and so it is. One of the things that is so remarkable about the sequence of the events of the Last Supper, the first Mass and Good Friday, is that in every other case, in order to have a fruit, you must have a tree that precedes it - that's already there to bear fruit. In the case of the Eucharist, the fruit of the Last Supper - the real presence actually precedes the tree of the Cross. At every Mass, we offer the sacrifice of Calvary back to the Father. 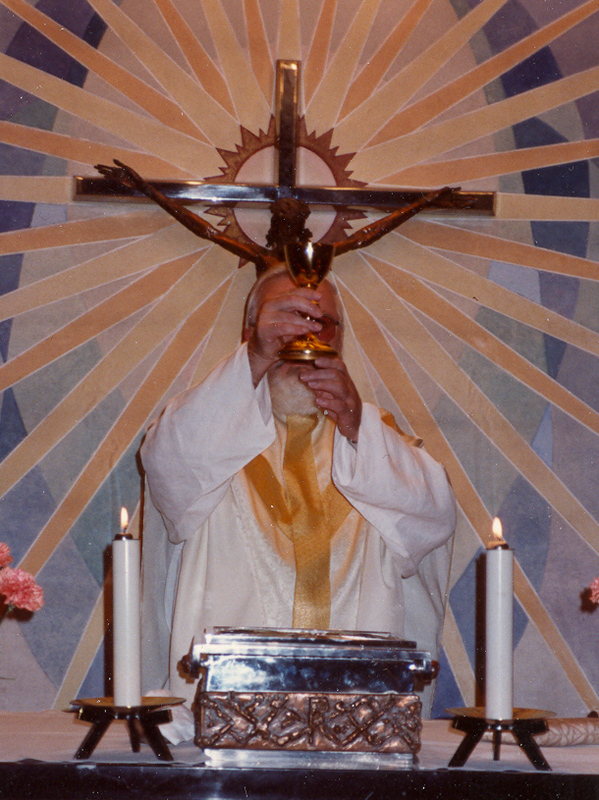 The priest, acting in the person of Christ the head, in persona Christi capitis, says the words of institution and consecrates ordinary bread and wine into the body and blood, soul and divinity of Christ Himself, the same Christ who died for us nearly 2000 years ago, now sacramentally present. I am always amazed at the faith of second graders, who can so clearly explain what this dynamic is all about. They rarely even have problems saying that fancy theological word, transubstantiation. It's so clear to them. They understand that the God who could easily create the universe by His Word, can even more easily transform bread and wine into His own body and blood - the living food who is Christ Himself. They also know that we consume living food. That's why we're not cannibals - they consume dead flesh. Second graders know that through the power of the priesthood. The Eucharist is then a double miracle. It's helpful to consider it in these terms: if I light a piece of paper with a small flame, paper ceases to exist and a new substance, ashes exists. When you change the appearance of a substance, it usually signifies a change in the substance itself. The Eucharist is different: the first miracle is the transubstantiation of bread and wine into the body, blood, soul and divinity of Christ. The second miracle is that even though the stuff or the substance of the bread and wine have been changed into the body and blood of Christ, it still looks like bread and wine, even though nothing of bread and nothing of wine remain. That is so we can consume the sacred species because the normal chain of events is that when I change the substance, I have also changed the appearance of that substance. Not so in the Eucharist - the substance has changed but the appearances never do. That makes the Eucharist consumable - most persons would have difficulty eating cardiac tissue or type O blood if the appearance of who is really present changed. John's Gospel does not provide us with the narrative of the words of institution of the Eucharist found in the other three Gospels. You don't hear our Lord say the words of consecration in John's Gospel. Actually, the oldest account of the words of institution are from St. Paul's letter to the Corinthians in our second reading. This account is even older than the accounts in Matthew, Mark and Luke. St. John probably didn't include the institution narrative in his account because he was writing in the late 90s, at the end of the first century and there was no need to repeat what was already known to the early Church. Instead, we are given the story of the washing of the feet. It adds another dimension to the Eucharist - service. Just as Jesus is broken and spent for us in the Eucharist, so we are called to be broken and spent for others by making gifts of ourselves to others. This spirit of service, humility and what Christ did for his own may be summed up in the first sentence of today's Gospel, "He loved them to the end." The intensity of Christ's love for us brought Him to lay down His life for us and yet even death can't contain His love, for He rises from the dead in order to continue loving us infinitely. Pay close attention to the actions that our Lord takes in order to wash the feet of the Apostles, a task appropriate for household servants. Bishop Fulton Sheen tells us that seven actions are mentioned: rising, laying His garments aside, taking a towel, putting it about Him, pouring water, washing feet and wiping with a towel. Sheen sees this scene as a summary of Christ's taking on our humanity. Our Lord, rises from the heavenly banquet of union with the Father, lays aside His garment of heavenly glory, wraps the humanity which Mary gave Him around his divinity, pours out His blood to redeem us and then washes our souls through the merits of His death and resurrection. At first, St. Peter has an adverse reaction: He won't allow Jesus to wash His feet. Christ explains that a refusal to accept divine cleansing is to deny intimacy with God. Peter still cannot understand that divine love means sacrifice. Once Jesus explains that Peter must allow himself to be purified of his sins, Peter wants his hands and head washed as well, as if to say that both the deeds of his hands and the thoughts of his mind need purifying as well. This is an indication from our Lord that in order to receive Holy Communion worthily, we must be free of mortal sin. Of course, the Eucharist does not stand alone. It is intrinsically tied to the other sacrament that our Lord founded on Holy Thursday - the sacrament of Holy Orders. He chose 12 men including Judas, his betrayer, to extend into all time His own ministry. Our Lord knew that it would not be enough to simply leave us his teachings - it was necessary and still is necessary that the faith be given real flesh and blood reality in the person of priests so that our faith doesn't operate in the abstract. The humanity of the priest guarantees that the Father's love never becomes abstract. Priests, acting as alter Christus - other Christ's in the world continue the Father's outreach to the Holy People of God. In their celibacy, priests already witness in their bodies the way that we will all live in heaven, where there is no giving or taking in marriage. What a humbling privilege it is to be a priest - to stand in the person of Christ and to continue his saving work in the world - a dignity not even given to the angels. Even the angels can't consecrate the Eucharist or forgive sins, but a priest can! It should amaze us that God would love man so much that he would chose to share his very work in the world through the hands of priests. I would like to close by sharing an experience I had late last year in Sienna, Italy, while leading a pilgrimage to Italy. I think it appropriately ties together the connection between the Eucharist and the priesthood. Our group was able to make a visit to the Church of St. Francis, where the Eucharistic miracle is reserved in a side altar. In 1730, thieves stole a ciborium full of consecrated hosts and dumped them in a poor box, taking the gold of the ciborium for themselves. The hosts were discovered soon thereafter and the bishop permitted to have the hosts decompose naturally on a sunlit altar, according to the discipline of the Church. The only problem is that the hosts haven't decomposed a bit since 1730 and have been scientifically proven to be as fresh today as they were the day they were baked so many years ago. It is one of the many Eucharistic miracles we have - several popes have come to venerate the miraculous hosts. And as miraculous as they are, the priest who allowed us to have adoration of the sacrament, reminded us that every host is a miracle because ordinary bread and wine become the body, blood, soul and divinity of the Lord Jesus - who is the same, yesterday, today and forever. These communion wafers became hosts - the real presence of Christ Himself through the consecrated hands of a priest, who himself unworthy, was able to confect the Lord Jesus, by a simple command, doing all of this in memory of the master - not in a vacuum, but in real time - making Christ literally present in our midst. O Sacrament most holy, O Sacrament divine, all praise and all thanksgiving, be every moment thine, and may the heart of Jesus, in the most blessed sacrament of the altar, be praised adored and loved, at every moment, in all the tabernacles of the world, even until the end of time!